Cynicism taints almost every facet of my life. This may seem like an odd confession to make at the start of a literary influences post—especially one that focuses on the eternally optimistic works of L.M. Montgomery—but I feel like it has to be said. I acquired my cynicism by degrees from a pretty young age. By the sixth grade, I was a smart-mouthed, sarcastic, socially isolated 11-year-old. My only reliable friends were books (and with little wonder, given my temperament). That was the year I met Anne of Green Gables. I’d love to say that her adventures cured my cynicism, but they didn’t. Instead they offered me a momentary refuge from my social woes and a glimpse into a world far more pristine and optimistic than the one I struggled against. The contrast between Anne’s life and my own was so glaring that, far from purging my darker thoughts and inclinations, she probably reinforced my cynicism all the more. Everything always turned out for the best in her world. Everything was in shambles in mine (or so I thought). I was Alice on the wrong side of the looking glass, peering into a Wonderland of hope and dreams. And my 11-year-old self lapped it up. By December I’d devoured the first five books in the series. I received the set of eight (Anne of Green Gables through Rilla of Ingleside) for Christmas and polished off the remaining tales. I moved from Anne Shirley to Emily Starr, to Pat Gardiner, to Valancy Stirling. I read everything I could get my hands on—short stories, stand-alone novels, series—and then I went back and reread the ones I really loved over and over and over again. No 11-year-old wants to be a cynic. It doesn’t come naturally at that age, but mine was a cynical path. The works of L.M. Montgomery lit the way, casting such stark contrast against my life’s experiences. They taught me not to be miserable in my cynicism, that there was always escape, even if that escape lay in far-off Castles in the Sky. Anne Shirley, the precocious, redheaded orphan, goes to live with an elderly brother-and-sister pair who wanted to adopt a boy and got her by mistake. She’s resourceful and intelligent and she makes the best out of every single situation that confronts her. Seriously. Every single situation. The series follows her from the age of 11, when she’s adopted into the Cuthbert home, through her school years and university years, marriage, family, and even her children becoming adults. And through it all she’s prosaic and pure, a shining light who draws everyone to her, winning over even the most dour of acquaintances with her winsome charms. It’s strange to analyze a childhood influence from an adult perspective. I read her stories so many times in my youth, but when I tried to re-read them after college, I only made it halfway through the second book. Anne’s unfailing good cheer made me want to wring her pretty neck. In honor of my childhood nostalgia, I’ve left the series alone ever since. In truth, you see, the smart, lovable practically perfect Anne was never my favorite of Montgomery’s heroines. I’m always surprised to learn when someone has never heard of the Emily books. Everyone’s heard of Anne of Green Gables, but Emily of New Moon? Not so much. And that’s a blooming shame. At one point in my early teens, I became so fixated upon owning my own copies of the Emily books that I dragged my mother from one bookstore to another until we finally found them. I paid full price, with my own money. For a young teen of my ilk, that right there was dedication. Emily Byrd Starr, like Anne, is an orphan. Unlike Anne, she’s orphaned at the start of her first book. We meet her father. We experience his death and her sense of abandonment. Also unlike Anne, Emily has a whole slew of relatives, and they pretty much hate her guts. Well, not really, but they hold her in contempt because her parents had eloped and caused a scandal for the dignified family. Her Aunt Elizabeth shelters her out of duty and familial pride, but as a result Emily becomes love-starved and neglected. She finds refuge in writing poetry. In my youth, I identified more with her best friend Ilse Burnley than her—Ilse, who loves to recite and wants to be an elocutionist and needs friends so badly that you can’t help but love her. My loyalty shifted with age. Emily is a budding author, quiet, reserved, and obsessed with writing. She chooses isolation over social advancement. And, unlike Anne, she is not prosaically optimistic all the time. She’s often cynical, cold and heartless and withdrawn on the surface but roiling with emotions beneath. She is strong and stalwart in her convictions, even if those convictions mean that she might be miserable and isolated for the rest of her life. 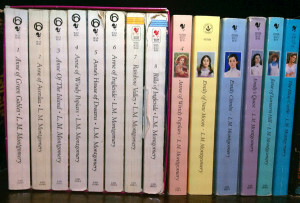 There are only three Emily books, but they are, in my opinion, so far superior to the Anne series. They delve deeper into the human experience. There’s even a mild fantasy twist to them (which, of course, I love). I may feel nostalgia when I think of Anne, but I hold a deep reverence for Emily. She is, to use a Montgomery-ism, a literary kindred spirit. This book is even more obscure than the Emily series, and it’s probably had the greatest influence on me, at least where my writing is concerned. Valancy Stirling is a 29-year-old spinster living with her oppressive mother, who smothers her with feelings of worthlessness and family decorum. She’s hopeless about life and stuck in a routine she despises but cannot escape. At the start of the book, a chronic pain in her chest leads her, in secret, to a doctor who diagnoses her with a terminal heart condition. In response, Valancy goes off the deep end, intent upon packing her final year with all the living she’s missed in the previous twenty-nine. The premise of this book was so compelling to me that I actually applied it to a fantasy setting and wrote an entire novel of my own (as yet unpublished). My heroine is not Valancy, but her emotional origins come from the same place, and she confronts an impending death sentence with the same stalwart determination. The Blue Castle, fanciful as it is, still captivates me. Its influence on me as an author is so blatantly obvious that I would be an ingrate and a liar not to recognize it publicly. I’m an amiable cynic these days. If I read L.M. Montgomery, there’s admittedly a lot of skimming going on. Her descriptive paragraphs get a touch too sentimental for my tastes. I don’t absolutely love everything she’s ever written (I recently re-read Kilmeny of the Orchard, for example, and it’s particularly awful). But to my 11-year-old self, she was a Godsend. To my current self, she is yet a muse and an inspiration. If I ever happen to meet her in the afterlife, I’ll be hard-pressed not to give her a crushing hug. So says the cynic. Because it’s possible to view a selfish, self-interested world and still harbor feelings of hope and optimism. On that note, perhaps I’ll go revisit optimistic Anne again. The Blue Castle is my all-time favourite L.M. Montgomery book. I loved her books growing up, though I did find them sentimental at times: now The Blue Castle is pretty much the only one I re-read. Anne, I used to love, but a few years ago I started almost to dislike her. Because she was ‘special’ and ‘imaginative’, she seemed to get everything that Diana should have had a part in, and I felt indignant on Diana’s part. Poor Diana, to have only beauty, and no ‘winning ways’! I felt that it wasn’t fair for Anne to get all the love when Diana couldn’t help being beautiful and just a little bit stupid. Especially when Diana loved Anne so much. I think I’ll still always love Anne of Green Gables, but sometimes I can’t help feeling that I like Diana, with her beautiful stupidity, just a little bit more. Thanks for your comment! I agree with many of your sentiments, but I will draw the line at Dean. Honestly, he creeps me out. He’s a predator, and if he had ended up with the girl, I think I would have burned all three books to ashes. It’s not his disability that bothers me. It’s that he’s old enough to be her father (he actually went to school with her father) and he starts grooming her as his potential lover from the time she’s, what, 13 years old? I cringe every time I read one of his scenes. He plays the woebegone nice guy, but his motives are as dirty as they come. Every conversation he has with her, every letter he writes, every interaction has an ulterior motive. I mean, he almost destroys her writing career and then takes advantage of her fragility in the aftermath *knowing* that he caused it all. In short, if there’s a villain in the Emily books, that villain is Dean Priest. So, I had to crack open my copy to make sure *I* wasn’t remembering wrong (preference for Teddy leading one to dislike Dean, and all). As it turns out, Emily’s only 12 when she meets him, and in that very first conversation, he tells her he’ll “wait for [her]” and promises that someday he’ll teach her the language of love. He’s in his 30s. Ick. Given how loyal Emily is to her friendship with him throughout the series, it seems like Montgomery meant him to be a sincere and even likable character. I don’t know what to say to that. For me, he fell out of the Creepy Tree and hit every branch on the way down. I think I just never realised quite how old Dean was: in my mind ‘old’ at that stage was something like 25. (Reckon I was 10 or 12). That *is* kinda ick :/ I have a character who is nearly 30 and trying to make a 15 yo fall in love with him in order to break his curse, but he’s *meant* to be evil at that stage. I can think of a similar vein in ‘Rebecca of Sunnybrook Farm’, where it seems that an older gentleman is taken with Rebecca (who is about 14, I believe.) In that case, however, he doesn’t pursue her or make creepy-talk, he simply waits and realises that it’s well within the bounds of possibility that he may have to watch her fall in love with and marry a young man more her age. Also, I think he may be in his twenties, but I’d have to read it again to be sure. Montgomery is always a bit hit and miss with her characters: some of her mother-figures in the short stories fall nothing short of creepy in their possessiveness toward their sons (think Mrs Thornton, only MORE so). Then again, when she writes a good character, oh boy, does she write a good one!